Choux Pastry Buttermilk Crepes (Заварные Блинчики) - Let the Baking Begin! This Choux Pastry Buttermilk Crepes Recipe is an easy crepe recipe. A recipe on how to make crepes, with one trick that makes these crepes virtually tear free. A delicious Crepe Batter that produces crepes with a lustrous sheen and chewy texture. With several of my latest posts being for crepe recipes you can see that I’ve been on a crepe kick lately. Today I wanted to share a recipe for Choux Pastry Buttermilk Crepes that have a peculiar technique of making them. As you know, choux pastry (think of batter that makes cream puffs, eclairs) is just batter or dough that’s made by heating it over direct heat to partially cook the batter before baking it. This Choux Pastry Buttermilk Crepe recipe is made using a similar technique. The Crepe Batter is mixed, then the boiling hot milk is added into it. This speeds up the gluten formation, which creates tight bonds between the cells and prevents the tearing of the crepes as you cook and flip them. The technique is also responsible for the lustrous sheen of the crepes, like that of a silk fabric. All perfect for a delicious breakfast or dessert! 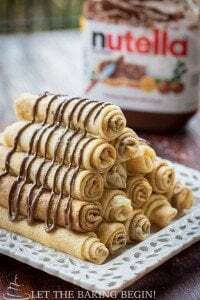 These Choux Pastry Crepes can be made ahead of time and just heated in the microwave when you’re ready to eat or you can prepare just the batter ahead of time and cook crepes right before serving. What skillet do I use to make the perfect Crepes? Let’s talk about the skillet. 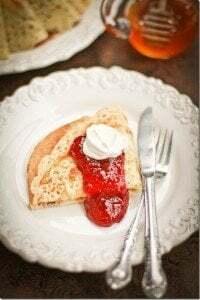 I have always made my crepes using the ceramic or nonstick skillet for easier flipping of the crepes, although I do know my mom back in the day has always used a stainless steel skillet. For this tutorial, I used my stainless steel skillet with incredible results. In fact, I was so impressed with how much easier it was to remove and flip crepes using the stainless steel pan that I most likely will not be making them in anything else from now on. So, either a good nonstick skillet or a regular stainless steel skillet will work for this recipe. Brush the skillet with some oil with the help of a paper towel dipped in oil, then heat the skillet over low-medium heat. When ready to cook crepes, turn the skillet to medium-high heat for the first crepe. For the rest of the crepes you can turn the heat down to medium or slightly lower than medium. That’s all. Add eggs, salt, sugar, buttermilk and flour to a blender. Whiz for about 30-45 seconds stopping every 15 seconds to scrape down the sides from flour. In a separate bowl mix boiling hot milk & baking soda for about 15 seconds. Add the hot milk into the crepe batter while continuously whisking or while the blender is running. Now add the oil and whiz for another 10 seconds to incorporate the oil well. Remove the foam off the top of the batter and discard or cook separately. The batter is ready to be used, but can be refrigerated for up to 24-48 hours (just whisk before using). To a bowl add eggs, salt, sugar, buttermilk and flour. Whisk until smooth. Combine boiling hot milk and baking soda and add it into the crepe batter while continuously whisking. Now add oil and whisk until fully incorporated. Skim and discard the foam. The batter is now ready to be used. Soak a paper towel with oil and go over the inside of the skillet. Alternatively, a pastry brush or non stick spray can be used. Do this only before the first crepe. Heat skillet over medium heat until hot. Raise the skillet to a 45-degree angle. Now using a measuring cup or a ladle pour the batter in a crescent shape over the raised part of the skillet, then whirl the skillet around until the batter completely covers the bottom of the skillet. When the top of the crepe has no more wet spots, run the spatula underneath the edges of the crepe, then lift it with hands or spatula and flip it. Cook for another 30 seconds to a minute and remove to a plate. Continue cooking crepes until no more batter remains, stacking cooked crepes one on top of the other. What can I serve these Choux Pastry Crepes with? These crepes can be filled with either sweet or savory fillings. For sweet, try pouring some canned sweetened condensed milk over them. Jam or cream cheese also works really good as a filling. For savory, try using ham, cheese, smoked salmon, scrambled eggs or sausage. I hope you give this Choux Pastry Buttermilk Crepe recipe a try! By the way, what is your favorite way to eat crepes? Do you like them filled, or do you just fold them and dip in something sweet? Share below in the comment section! Crepes with Strawberry and Raspberry Sauce – Delicious berry filled crepes. Savory Crepes – Crepes filled with beef and mushrooms. Farmer’s Cheese Crepes with Blueberry Sauce – Crepes filled with smooth and sweet farmer’s cheese. Add eggs, salt, sugar, buttermilk and flour. Whiz for about 30-45 seconds stopping every 15 seconds to scrape down the sides from flour. In a separate bowl mix boiling hot milk & baking soda for about 15 seconds. Add the hot milk into the crepe batter while continuously whisking or while the blender is running. Now add the oil and whiz for another 10 seconds to incorporate the oil well. Remove the foam off the top of the batter and discard or cook separately. The batter is ready to be used, but can be refrigerated for up to 24-48 hours (just whisk before using). Soak a paper towel with oil and go over the inside of the skillet. Alternatively, a pastry brush can be used. Do this only before the first crepe. Heat skillet over medium heat until hot. Raise the skillet to a 45-degree angle. 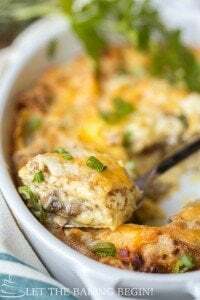 Now using a measuring cup or a ladle pour the batter in a crescent shape over the raised part of the skillet, then whirl the skillet around until batter completely covers the bottom of the skillet. Serving Suggestion: These crepes can be filled with either sweet or savory fillings. For sweet try pouring some canned sweetened condensed milk over them. Jam, or cream cheese also work really good as a filling. For savory, try using ham, cheese, smoked salmon, scrambled eggs or sausage. Hello there. I wanted to ask you what kind of oil you use in these and what brand of oil you like best. Hi Alicia, I use Olive oil from Costco (Kirkland Brand). It doesn’t have a very strong taste or smell, so I use it in all of my cooking. These are delicious! Thanks so much for sharing! Would love know what sauce you are pouring over them and if you would share th recipe? Hi Michelle and thank you! These look amazing! Thnx for sharing! Have you made a crepe cake before using this batter? Is it also possible to use half and half milk instead of whole? To be honest, I’m not sure. But I think it would work. I can’t wait to try these. But I was always under the impression that Choux was a specific way the eggs and butter were cooked, creating a dough similar to cream puffs. I just wanted to double check how much milk these crepes require. On Pinterest it says 5.5 cups and on here is says 1.5 cups. Thank you in advance. Always go by what the blog says instead of Pinterest, because Pinterest sometimes combines ingredients from two different components (like, lets say butter from the frosting and butter from the cake layers would be combined into one total, instead of two separate ones). These look amazing! I noticed that you mentioned baking soda as an ingredient. Is this actually supposed to be baking powder? Oh, I didn’t know baking soda could be used! Do you have any suggestions for a substitute? I don’t have baking soda. Of corse it can 🙂 In fact many baked goods use baking soda. You can substitute baking soda with baking powder in ratio 1:2. So if this recipe calls for 1 teaspoon of baking soda, put two teaspoons of baking powder. These are absolutely amazing! I found this post on Pinterest and am now your newest follower! You are so talented! Everything is perfect and so delicious, I can eat it off the screen! Savory Crepes (Блинчики с Мясом) Let the Baking Begin! Your photography is just amazing! I visit your blog not just for the wonderful recipes but to also enjoy the pictures you post! Thank you so much for your hard work and efforts! Thank you Yelena! Your and other followers’ feedback is what keeps me inspired to post more stuff and to hopefully improve with each time. Thank you so much for taking the time to leave such kind words. I’ve told you on instagram how beautiful this picture is and i wanna repeat myself… if you keep posting crepes i will be super happy. Its funny how there are like 100 different recipes!!!! my mom, mom in law, grandma and I all have different ones from thick crepes with egg on each slice and other ones with sugar on each one of them then the all traditional ones that are super thin…. Do you know the original ones Russia started with?? I always wonder this every time i make them! These are INCREDIBLE! Your photos are some kind of magic, my friend. Very, very beautiful. It was our family tradition to have them every Saturday as well and I always considered my mom’s crepes to be the best. She always used kefir as the base and I am thinking buttermilk is pretty similar. Now I am so excited to try out your recipe. Buttermilk and kefir is really the same thing. The bacteria that cultured the milk might be different, but flavorwise it’s the same thing. Oh My!!!!!! Marinka, these are perfect!. Wow. I made crepes twice last week too. My kids can eat them everyday, just wish they weren’t so time consuming. I am so fascinated with cooking them in the regular stainless steel skillet that I seriously make them because I enjoy the process lol. My family asked to stop for a little bit haha. These look insane girl! And here I am trying to test out “healthier” versions of crepes and then you post this deliciousness! Ha ha. We love crepes and have them every Saturday morning (it’s become kind of a family ritual) ! I wanna see your healthier ones and I like your tradition! 😀 I was just talking to my husband today and was telling him that as much as I like to eat them, I like the pouring and flipping and rolling even more than eating them lol. I have one more recipe that I will post (crepe) and then after that I think I will be done for a little bit lol.